Have you ever wondered why a great idea just didn’t fly? Or why a product or service is thee one day and gone the next? Ideas, in any form, have a life. Some ideas lives are long and prosperous, some take strange turns and soar to new successes, unfortunately, others quickly crash and burn into a pile of smoldering junk never to see the light of day. As I have illustrated here, ideas have a cycle they follow. The all begin pretty much the same. They are created, then adopted by those early followers. Soon they are accepted by others and move to the next level or cycle of their life. Here the mystery begins. As with all ideas, external influences determine the success or failure of a given idea or product. It is the exploration of conditions that can help us expand the life cycle and add to the level of success. The mystery I am presenting is that of change. Change is a cloud of uncertainty. 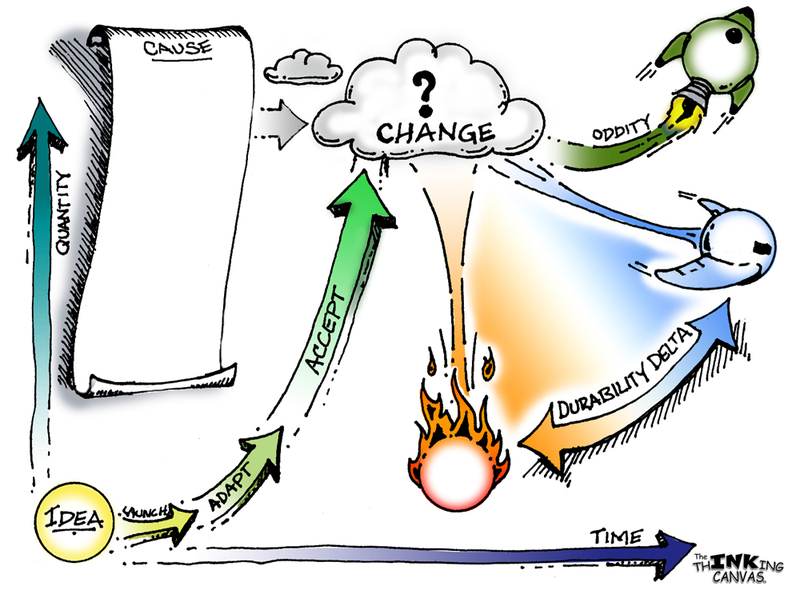 Many things can bring about change to an idea, but once change is introduced, the reaction or effect drives the idea into the Durability Delta. Here the true test of an idea plays out. So how can this diagram help? By thinking of the possibilities that can create change such as; competition, quality, supply, demand, etc.. and thinking about all those things that can impact an idea. List every possible cause for change in one column and call this column “Causes”. In a second column, list the possible effects from these causes. Allow yourself some room. In a third column create a list of possible defenses to the causes. Okay now you have the idea, what can impact it, the possible outcomes from those causes and even possible ways of defending those causes, maybe. Now add one last column. Label this column as “Employ”. This column is where the devil advocate likes to play. Here you think of ways to use the cause to your advantage. Let me show you an example. A competitor has improved the idea by adding some new benefits and has been able to keep the selling price close. Consumers begin shifting to the newer idea because the benefits out weigh the price difference. It’s a better value. Lower your price, change your idea or give up the idea for a new idea. Act like your own competition. establish a team or panel whose sole task is to try to improve or “knock off” your idea. What changes could be made to make the product competitive to the original idea. Maybe you could spin a second brand where you are your own competition. Using the Cycle of Innovation chart helps developers and business owners to look beyond the moment and play “What If” game around the idea. It may reveal weaknesses that can be re-enforced or unseen strengths which you can build on to further improve the idea. It doesn’t matter what your idea may be or how innovative it is, it still has a life cycle which is always affected by change. The more we can understand the causes and their effects, the better we can plan for the life of the innovation or the anticipation of the next level of the idea. I hope this helps you as much as it helps me.